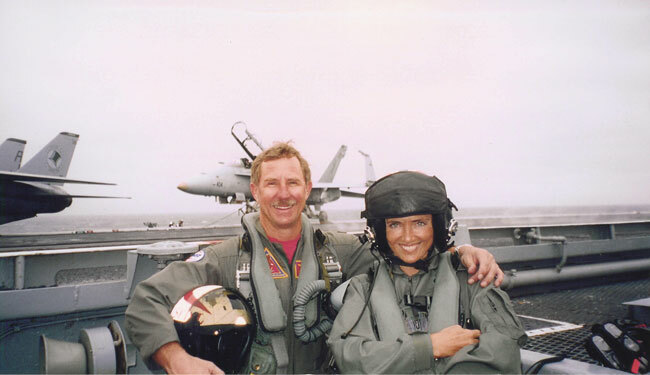 It began at the NAS Oceana O Club at the end of a successful airshow weekend in late September, 1999, when U.S. Navy Captain and Commander of the Strike-Fighter Wing Atlantic John “Lites” Leenhouts joined our table. I’m not sure where Lites got his call sign, but he is the kind of person who lights up any room with his personable, enthusiastic nature and great sense of humor. 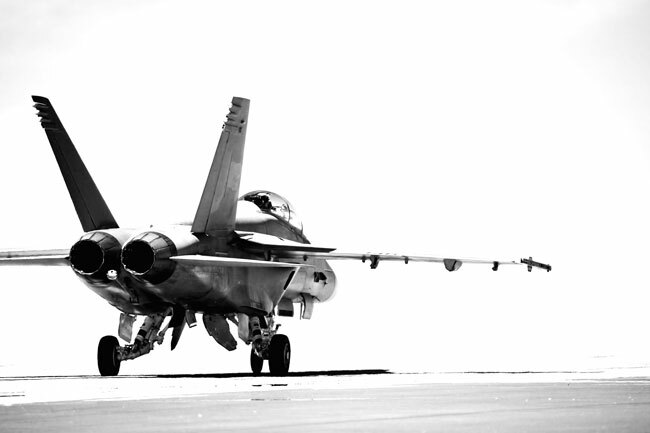 We started talking about cool airplanes, and Lites asked if I’d ever been in a Hornet. I hated to admit that I had flown with the Blue Angels during a practice flight, because it might disqualify me for a second ride—if that’s what he was getting at. Then he asked if had I had ever flown out to an aircraft carrier. Could it be true? We set a date to fly out of NAS Norfolk the following March 17, 2000, and I tattooed that date on my brain. I asked what I should bring, and Lites said to bring a swimsuit for water survival training. 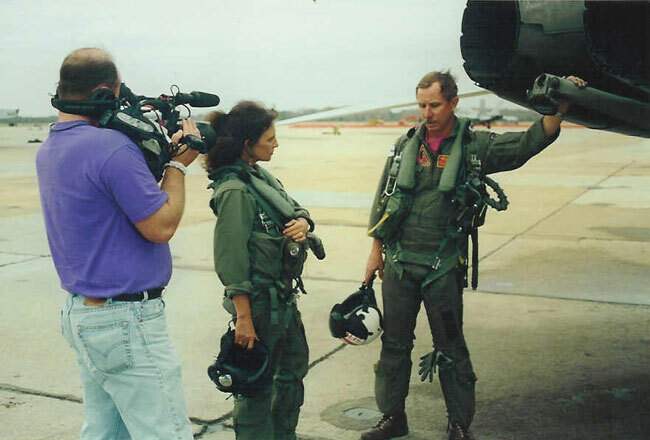 When I flew with the Blues in Oklahoma, a water ejection wasn’t a consideration. Flying to a carrier however, the training was mandatory. As a swimmer, surfer and beach girl, I was excited about it. I thought it would be a breeze, but, boy, was I in for a surprise. When I jumped in the water in full U.S. Navy flight gear—flight suit, survival vest, G suit, helmet and boots—and was told to swim the length of the Olympic size swimming pool, I thought, “Swim? You’re kidding me!” I had lead weights attached to my extremities. The Navy Seal Instructors were encouraging but said no swim, no fly. They told me there were no rules how I got there—back stroke, side stroke, freestyle—as long as I made it to the other side of the pool, an eternity away. By sheer will and motivation, I raised my feet into a horizontal position and started moving slowly, like a turtle, across the pool. I wasn’t sure I could do it, but several instructors stood cheering me on as I placed my hands on the ledge at the far side of the pool. Next we had to tread water for a full 5 minutes in our gear. The Instructors gave me some tips—relax, conserve energy and get a little air under my helmet and use that to float upside down. Another task was swimming, blindfolded, through a narrow cage with a 90-degree bend, simulating a fuselage. The catch was that another swimmer would be coming from the opposite direction, and you would meet up somewhere in the middle. 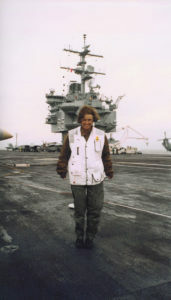 It wasn’t easy, but I passed and was now ready for my F/A-18 Hornet ride to the (now-decommissioned) USS Enterprise, the world’s first nuclear-powered aircraft carrier and the longest naval vessel ever built, with a huge crew of over 4,500 service members. Flying in a fighter takes some getting used to. It can be a very claustrophobic experience. You are wearing a lot of gear, and the G suit has to be very tight. The helmet fits tightly, too, and when you don your oxygen mask, breathing feels labored, and it’s easy to hyperventilate until you learn how to take each breath in slowly and deeply. By the time I made this flight, I had flown in the F-16, F-18, F-15 and the back seat of an F-14, so I felt relaxed and comfortable. I had completed water survival, egress and high-altitude training, and most importantly, I would be flying with best of the best. 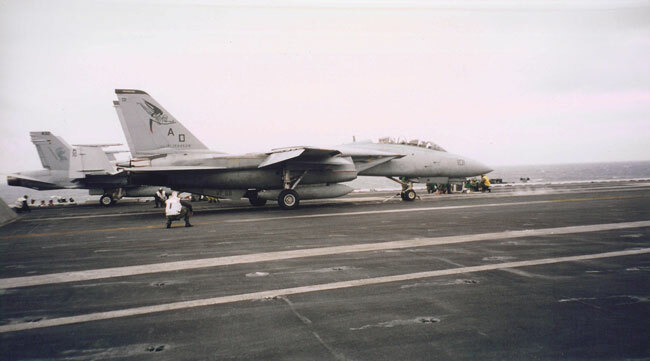 Lites had the Navy’s all time highest number of “traps” on a carrier, over 1,600 on 16 different aircraft carriers. Ready, set, go! We took off from NAS Norfolk and headed to the boat on a cloudy, rainy day, and stayed in the goo for most of the flight. Another Hornet joined us and flew in close formation off our wing, and I remember being as happy as a clam. 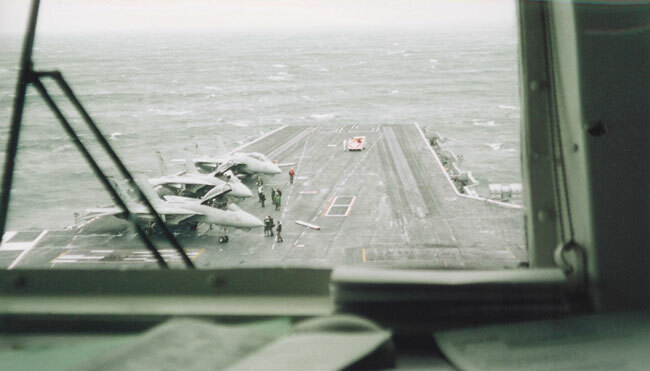 When we got close to the carrier, our wingman got in trail, and we started a descent into visual conditions but still overcast ceilings, and I noticed some white caps on the water. Then I had my first sighting of the USS Enterprise. I had never set foot on a carrier, but it looked rather large from the air, a reasonable place to land. We were lined up on final, and I strained to see the famous “ball” but I don’t recall that I ever did. As we came barreling down the glide slope in our magic war ship, Lites’ expert hands guided the machine to the tiny pitching deck, and the next thing I remember was looking out at the water in front of us and wondering—are we going over the edge? Do we need to eject? This was clearly sensory overload like I had never experienced—I remembered nothing from the time we touched down to the time the tail hook was pulling us backward to a safe place on the deck. The Enterprise no longer looked big; in fact, it was extremely small. We folded our wings and turned around with our nose poking over the edge of the deck (does he know where the mains are?! Have faith! ), and taxied to a designated spot, lining up closely to several other jets, and then we waited. After some radio chatter, which I only understood a part of, such was the language of the Naval Aviator aboard a boat, we waited for what was next. The weather was windy and overcast, and this worked in our favor. Because Lites was the high-time expert, the control tower gave us the opportunity to take off again to assess weather conditions for the trainee pilots on board, so we “had” to do another trap. Lucky us. But first we had to take off, and I would have my second shot at sensory overload. As powerful an airplane as an F/A-18 is, it clearly needs some assist to take off from a 300-foot deck and accelerate from 0 to nearly 200 knots in two seconds. While the ground crew hooked the airplane up to the steam catapult, we sat in our bubble surrounded by noise and controlled chaos. As Lites took his hands off the control stick and put them on the handles that carrier pilots use on cat shots so they don’t overpower the controls and cause the airplane to PIO after take-off, he said “You never know the exact second the catapult releases, but I can guess…Ten, nine, eight, seven….one…” Zoom! After the cacophony on deck, the peace of being launched over the water was like being in heaven. And, if I wasn’t, it would have been a good day to die. I remember hearing that the relative silence after a cat shot makes a pilot wonder if they lost their engines, so I took a quick look at the gauges and knew that everything was fine. We checked the weather and ceilings, and then did our second trap. This time I was a little more aware of the touchdown. And later that day, on our third trap, I was actually aware of the touchdown, and things started to slow down. The cat shot, however, continued to be a bit of a blur, and still one of the coolest things I have ever done. On the way back to NAS Norfolk, Lites gave me the controls, and we had a little fun with some akro before landing and the end to one of the best days I’ve ever had. It’s interesting how we can become conditioned to the most intense experiences. I doubt there is anything as physically and mentally demanding as landing a fighter on an aircraft carrier, short of a rocket launch into space, which I have not (yet) experienced. People often think fighter, race and airshow pilots are in it for the adrenaline, and that couldn’t be farther from the truth. Adrenaline is a sign that things are out of control—your palms sweat, your hands shake. The U.S. Navy training system that enables pilots to become conditioned to overcome sensory overload and gain situational awareness required to do these things is beyond impressive. Being on deck while jets are being launched two at a time is such an outstanding display of teamwork and efficiency from all crew members involved, and a choreography and expression of science, physics, mechanics, will and motivation. It makes me realize that us humans are capable of so much more than we demand of ourselves. When I do something new, I don’t normally have expectations. I’m not an obsessive researcher, at least until after the experience, which I then use as a reference to help me understand the nuances of the experience more deeply. I think the best way to approach something new is to understand the risks, prepare for them, accept them and then surrender to the experience. Even if you’re not experiencing something like landing on a carrier, once you’ve made the decision to do it, and it might be something as simple as flying a commercial jet somewhere, it’s important to accept and surrender to the experience just the same. Lites is now the President of Sun ‘N Fun, in Lakeland, Florida, and for fun he flies an array of fun airplanes, including his own Stearman. Things have tightened up since 2000, and getting approval for rides in F/A-18s, especially to aircraft carriers, is much more difficult. I am sure I’m the luckiest person on earth to have had the aviation friends and experiences I’ve had. I’ve always felt I was born at exactly the right time, just past mid-century. When I was a child, my mom would take me to SFO to watch the earliest passenger jets take off; I’ve sat in the jump seat of the 747 and am now watching it retire. I’m a grateful participant in the internet revolution and have flown in fighters that could be among the last of the manned airplanes, but that remains to be seen. And I keep asking myself—what’s next? Patty Wagstaff is a three-time U.S. National Aerobatic champion, inductee of the National Aviation Hall of Fame and one of the world’s top airshow pilots. Visit pattywagstaff.com/school.html or reach Patty via email through [email protected].